We at Till Roll Warehouse pride ourselves on ensuring all the products we supply are produced to the highest of standards and we use approved and sustainable sources of materials, we strive to ensure that as many of our products as possible are environmentally friendly and where possible our Till Rolls are FSC (Forest Stewardship Council) certified. To help our customers better understand the different types of paper used to manufacture the various types of Till Rolls, Till Roll Warehouse, Chip and Pin Rolls, Plain paper and Multiply Rolls available we have produced this guide. The guide will also hopefully aid you in choosing the correct roll for your machine and provide guidance as to how best store the product and retain and keep copies of receipts. There are three types of paper and paper rolls commonly used in the UK for use in Cash Registers, Tills, Credit Card Terminals, Chip and Pin Machines and Kitchen Printers. Thermal Paper is a special fine paper that is coated with a material formulated to change colour when it exposed to heat. It is an inkless printing process and is used in thermal printers such as adding Cash Registers, Tills, and credit card terminals. Thermal Rolls are single ply rolls that are available in white and other standard colours such as, blue, pink, yellow and Green. Due to the nature of the printing process and to guarantee performance of the product we do recommend our customers to store their Thermal Rolls in a dry place away from any humidity an out of direct sunlight and any other heat sources. It should equally also not be stored near any solvents or cleaning materials etc. Copies of Thermal roll receipts once produced will retain the image printed on them for many years providing they are stored properly away from heat and direct light. 2. A Grade Paper Rolls. A Grade plain paper is the most common of paper type that is used to produce plain paper rolls however they can also be produced from a variety of paper grades. Printing is peformed using ink Ribbons / Ink Rollers which are applied onto the paper inside the machine. A Grade paper guarantees the best performance in your Cash Register, Till or Kitchen Printer and maximise the print quality available. Unlike Thermal Rolls, A Grade paper is not affected in the same way by heat and direct sunlight, but we would still recommend these products are stored in a similar way to guarantee performance and length of life. 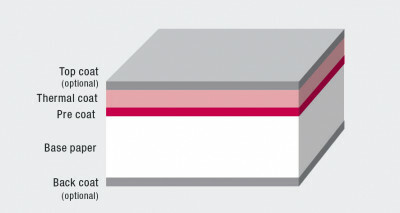 Carbonless Paper also commonly known as Carbonless copy paper (CCP), non-carbon copy paper, or NCR paper (No Carbon Required, taken from the initials of its creator, National Cash Register) is a type of coated paper designed to transfer information written on the front onto sheets beneath. 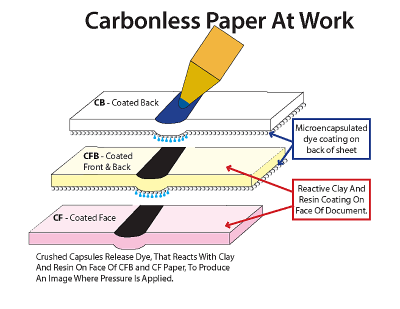 carbonless paper is a sheet of paper impregnated with dye which transfers writing or typing onto the copying surface below without the necessity for carbon pigment – see diagram above. Carbonless Rolls come in 2 ply and 3 ply options and have a variety of colour options. This type of roll is commonly used in kitchen printers where they will present in a high heat, high moisture environment, a place Thermal Rolls would simply not perform. We recommend the product is stored in the same way as Thermal and A Grade paper to guarantee performance and Length of life.